Mom, aka "Miss Marie". Mobility impaired. First time WDW guest. Sorta. Jenny. No BYPT this time. 5K participant and fellow survivor. 3) If you take something in this report seriously and get offended, I will laugh at you. I am not Disney. I ain't compensating no one. 4) At some point, I stop using full names, and start to use acronyms. For instance, Saratoga Springs Resort will become SSR. Disney's Hollywood Studios will become DHS. If this is overwhelmingly confusing for you, keep notes. 5) This seems to be half trip report - half "How to plan a trip to Walt Disney World with an aging parent and survive" guide. 6) Please remember to take all your personal belongings, and have a magical Disney Day! I take Mom to Disneyworld. Jenny helps. Early 2011 - I nonchalantly ask Mom where she'd want to go if she went on a vacation, and she sez Disney World. Okay, so I wouldn't have to pour the kool-aid. But I would have to have help at WDW, and wouldn't (and may not have needed) that same help if she would have said someplace like Bryce Canyon, which is a whole different vacation mindset. May - I am at Destination D: Walt Disney World 40th, and I mention to Jenny off-handedly that I was thinking about a trip there with Mom, but working out the logistics was pretty tough. She stup... graciously volunteers to help, she has experience in this area. She's 85. She forgets a lot. She hasn't traveled anywhere significant in years. She's been to Disney World once before, but I couldn't even say when that was. I think she stayed at Coronado Springs, and I found a receipt from Art of Disney for March 2, 1999. That would actually put her there when all four current parks are open, but she doesn't remember anything about it. 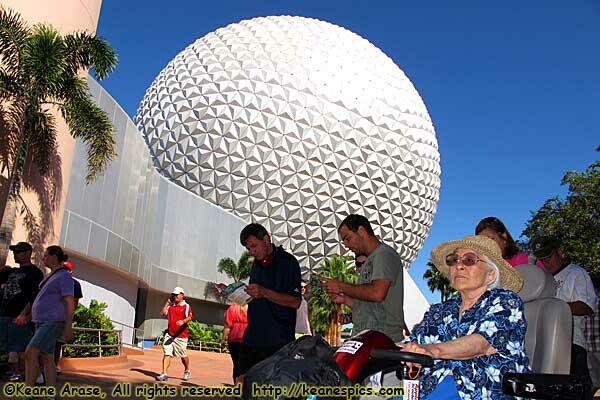 Epcot was that big ball. That's about the extent of her memories. She's mobility impaired, she can't walk very far, even with a cane. Her usual mode of transportation is a walker. So it's either a wheelchair or ECV at WDW. She's recently recovered from several health and health related issues, so she's a bit more active and alert than I've seen her in a long time. She's traveled before, but on tours. Mostly strangers, rigid itineraries, inflexible tour guides and schedules. Her trip to WDW was in a tour group, but had no guide in the parks. It was probably the epitome of the first time visitor having a bad experience at WDW. July 1 - I seriously start to think about a trip to Disney World with Mom. It's been in the "thinking about it" stage for a couple of years, and none of us are getting any younger. And I'd really like to get her away to someplace else other than her apartment for a week. But there's a lot to consider. Does she fly or drive down with me? We can also do one-way flying, and the other way driving, but that would involve coordinating someone to take her to and/or get her from the airport. Ugh. Someone has to take care of Figaro when I'm gone. I will have to beg PiC. She already has keys and knows where everything is. It'll be a hardship on the cat, but such is life. Where to stay? She says she didn't like where she stayed her previous trip (though she has a different memory of Coronado Springs than my experiences), so I'm contemplating two rooms at a deluxe. She will want her own room. That's the way it is. Adjoining would be best, but what if they can't accommodate me, and we're floors or buildings apart? Then too, one of those pesky two-bedroom villas that are always available at Saratoga Springs or Old Key West when I'm looking for a studio at Kidani keep creeping into the back of my mind. A two-bedroom villa (herein known as a TBV) is more expensive than two rooms at a deluxe, but I wouldn't have to worry about being across the resort from her room, and it would be easier to keep an eye on her. A TBV also has an extra room and a full kitchen. July 11 - I decide to stay on the "Keep It Simple Stupid" plan, and eat the expense in favor of convenience. I look into TBV's and post to RADP (mail me if you don't know what RADP is) and ask those who've actually been in TBV's some questions. What sort of configurations do TBV's come in, etc. Same day, Laura G. reads my post and writes me with an offer to rent me points and get me reservations for a TBV. Amazing. Without trying, one major hurdle already overcome. July 13 - Jenny registers for the 5K, wants to know when to make flight reservations. July 14 - Send Laura some hard dates to reserve, Sept 27 to Oct 3. I will arrive a day early to give Mom some scooter lessons and let her rest before we assault the parks. I give Laura a list of resorts (ha! ), and by the next day she can get the first four days at Saratoga Springs Resort (aka SSR) in a special needs (which, I guess is different from a fully accessible) TBV. Can't get the last two days, that's Half-Marathon weekend and the start of Food and Wine. The last two days are put on a DVC wait list. The only other conceivable night for a MNSSHP is October 2nd, the night before we leave. Hey, I've driven home on no sleep before. I purchase two AP rate tickets for October 2nd. Jenny has never been to a MNSSHP, so we're going to go and celebrate the end of the trip. On the other hand, I do purchase a 5-day Park Hopper through ESPN Sports Event Ticketing. It's quite a bargain, $234.30, vs. $325.89 normal price, including taxes. I am fully aware that we may not use all 5 days if the trip down or being in the parks might overly fatigue Mom and put her down for a day, but optimally, we will use all five days. And in the end, we don't park hop. It wasn't in the plans. But this discounted park hopper is still cheaper than a regular non- hopper, and just in case... The tickets are non-refundable, so in a way, we're committed! Jenny and I both have annual passes, so park tickets for us is a non-issue. Oh, and not only does Jenny come with an annual pass, but a Tables in Wonderland card too! I tell Mom a trip to WDW is a real possibility. I'm not sure she believes me. July 19 - Just in case DVC doesn't come through and Laura can't get the last two days, I go check to see the availability of two bedroom villas, and are given the choice of a Treehouse Villa or a Two Bedroom Villa at SSR. Obviously the cash payment crowd is a separate pool of rooms than DVC'ers. Thoughts of a treehouse dance through my head, but this isn't try something new time since Mom will be along, even though there are accessible Treehouse Villas. So, KISS again, I reserve the last two nights at SSR, with the vision of begging and pleading at the front desk to keep the same room for all six nights. Even if I do have to change rooms, I'll still be at the same resort. Interesting is the room rate. AP (Annual Pass) rates only extend through Oct 1, so the room for October 1 is $469, the room for October 2 is $685. I will have to re-book when AP rates through October is announced. August 1 - Roadblocks to the trip in mid-August disappear. I book 5 nights at Coronado Springs. We could do many of the attractions we wouldn't be able to do with Mom, like Star Tours. I can also look at the parks from a scooter perspective. I am sorta planning two trips at once, only the trip I started planning second will be executed first. It's around this time that I tell Mom the trip is a definite go. I'm still not sure she believes me, but I have enough pieces in place now that I can make a trip work. I actually buy a Birnbaum's. The last time I bought one, it was a superficial overview of Disney World, just what I'm looking for. I get the 2011 guide, and it's the size of some phone books I've seen. I give it to her anyway, with the restaurants and our resort post-it noted out so she can look it over. She has two months. August 15 to August 22 - Vacation at... Disney World! Sept 16 - I realize I still haven't reserved the darn scooter. I get on Apple Scooter's web site. I can reserve directly through their site. I am given four choices. Two are shorter range/lighter scooters that can be broken down and put into a car trunk. They have a range of 7 miles on a full charge. The other two are more robust, and have a 14 mile range. Each range category has a three-wheel and a four-wheel model. They both have their benefits. I will have a car, so being able to drive anywhere and still put Mom in a scooter is a plus. On the other hand, the other scooters are more robust, and we won't have to worry about range at all. My cousin with an elderly uncle was in town one week, and they had the smaller three-piece scooter. The scooter fit in the trunk of their rental no problem, but I want a more stable platform. I check off the four wheel "Deluxe" model. I think the only place we might go that would be a pain to get to would be Downtown Disney, until I remember we can take a boat. About this time, I once again inform Mom that we're going to go to Disney World. Everything's been taken care of, everything's been planned out, plan on being gone 9 days. We have the room, the tickets, the scooter, PiC will take care of Figaro, Jenny will help us at WDW, and she'll have two expert guides. She actually starts to believe the trip will happen. Sheesh. I have abandoned the idea of her actually picking restaurants out of the dozens or hundreds of choices, and instead ask what kind of food she wants to eat, and start picking out specific restaurants that would fit her want. Sept 19 - Plan September 28 at Animal Kingdom, the first official day in the parks. It's the day Jenny arrives. Reservations at Tusker House, 12:05pm. I've read all the mobility restricted pages and picked up all the park guide maps for the disabled, but unless you've done it before, it's pretty much ask the greeter CM. Planning the park is more determining which attractions are probably too rough for her, or of no interest. So most of Asia and Dinoland USA can probably be cut out. Much of the schedule will be dictated on how Mom is doing. Sept 20 - Plan October 1st, the day of Jenny's 5K. Boma seems appropriate, and get 4:50pm reservations. We will do either MK or DHS, but food there will either be Columbia Harbor House or a Turkey Leg on Sunset Blvd. Sept 21 - Plan Sept 30, Epcot, day 1. Call WDW tours and reserve 3 spots in the 11:15am Behind the Seeds tour. Mom wants to try the tempura in Japan, even though I think the tempura in Japan isn't that good... But we have 2pm reservations at Tokyo Dining. We will do The Land (or at least Living With The Land,) but from there will abandon Future World and tour World Showcase. We'll have no hard reservations the second day we're in Epcot. At the same time, I send Lisa some e-mail, and we coordinate a meal at the Turf Club at SSR on Tuesday, the day we arrive. It will be their last day and our first. It will be the first real exercise in scooter driving. Dinner with Lisa and Andy, 5pm. Sept 24 - Jenny and I finally agree to meet for lunch in Lebanon, TN, on my way down to WDW. We're going to exchange some food, and will take her suitcase down to WDW if I have room. Jenny is nervous meeting Mom. End September 2011 Trip Report - Part 1 of 8.